Enlarge / A protester holds a sign outside FCC headquarters on Dec. 14, 2017 before the vote to repeal net neutrality rules. FCC General Counsel Thomas Johnson struggled to explain why broadband shouldn’t be considered a telecommunications service, and struggled to explain the FCC’s failure to protect public safety agencies from Internet providers blocking or slowing down content. Oral arguments were held today in the case, which is being decided by a three-judge panel of the US Court of Appeals for the District of Columbia Circuit. (Audio of the four-hour-plus oral arguments is available here.) Throttling of firefighters’ data plans played a major role in today’s oral arguments. 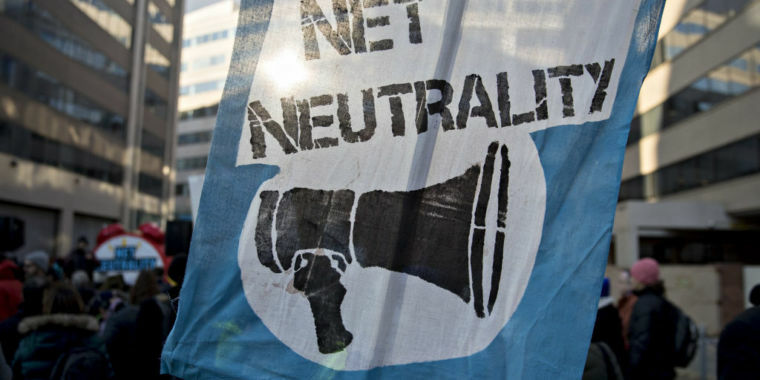 The lawsuit seeking to overturn the net neutrality repeal was filed by more than three dozen entities, including state attorneys general, consumer advocacy groups, and tech companies such as Mozilla and Vimeo. By contrast, US law says an information service is “the offering of a capability for generating, acquiring, storing, transforming, processing, retrieving, utilizing, or making available information via telecommunications.” It’s up to the FCC to determine whether something is a telecommunications or information service, but FCC decisions can be overruled by a court if they aren’t justified properly. Millett pointed out the importance of the “via telecommunications” phrase in the information service definition, which makes it clear that an information service rides on top of a telecommunications network. For broadband itself to be an information service, ISPs have to offer something more than a pure transmission service.